So today we are featuring his Jar Jar’s Mesa Soup, (or Jar Jar of Mesa Soup, or maybe Jar jar with Mesa Soup.) which is of course based on the Japanese favorite, Miso soup. Making Miso soup is easy, if you know where to look for ingredients. Your best bet is to go to an Asian grocery store to get a high quality Miso Paste and good tofu. If there are no Asian stores around, then Trader Joe’s has a boxed ready-made Miso Soup that our kids love, and TJ’s has good tofu too. Mix soup per directions on package: or check this recipe out from the Minimalist Baker. Cut tofu in small cubes and add a couple of handfuls to the soup while on the stove. Cut green onions and add to the soup base. Crumble some seaweed on top of the rice. Mmmm! 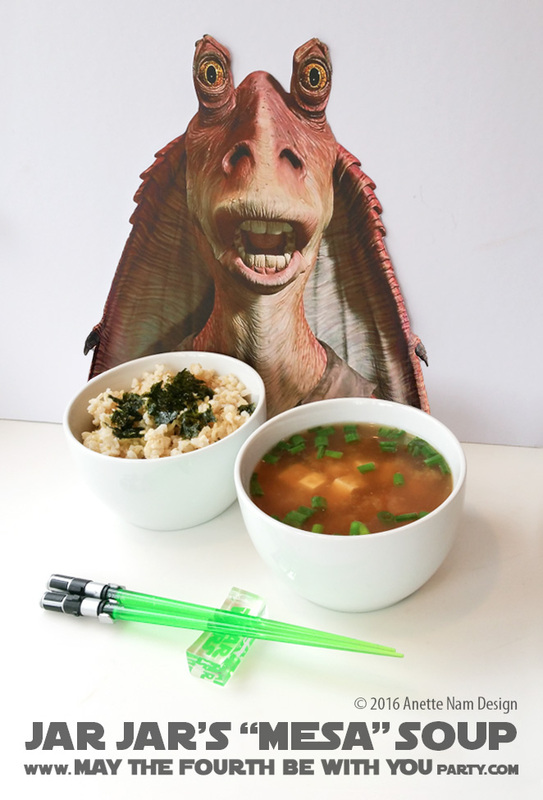 Meesa muy muy wuv miso soop! It is so good! Easy, quick, good for you, the kids love, AND now Star Wars-y. Talk about win-win!